UNITED NATIONS, Apr 14 2017 (IPS) - Climate change is making poor countries poorer, yet funding meant to address its economic consequences has been slow to materialise. Instead funding bodies are choosing to invest in green energy projects in middle-income countries. 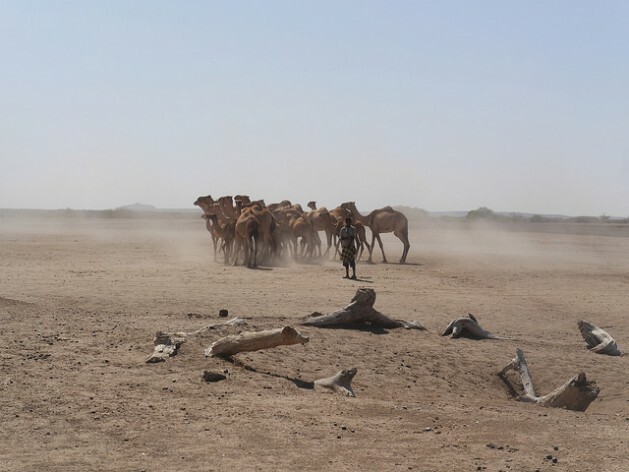 The trend continued last week when the Green Climate Fund (GCF), a new multilateral financing body set up to fund climate change related projects in developing countries, rejected a proposal to help farmers in Ethiopia cope with increasingly frequent droughts. “The 48 least developed countries, their capacity to cope with climate change is much lower than other developing countries,” Raju Pandit Chhetri, who was at the meeting, told IPS by phone. The GCF board argued that the proposed project was too focused on addressing poverty and not enough on the impacts of climate change. Yet Chhetri, who is Director of the Prakriti Resources Centre in Nepal, says that separating poverty from climate change isn’t so straightforward. “To reject an adaptation project for a poor and vulnerable community it is quite astonishing for me,” said Chhetri. Climate change, he says, is “an addition to the problems” that poor communities already have. Already scarce food and water will become scarcer. Limited job options in farming and tourism will dry up. “To reject an adaptation project for a poor and vulnerable community it is quite astonishing for me,” -- Raju Pandit Chhetri. The related nature of the problems, says Chhetri means that it’s difficult to separate out solutions that address only climate change or only poverty. A lack of clarity from the GCF around what types of adaptation projects it will actually fund is also causing confusion says Chhetri who says that should also be some room for experimentation in this new area. Yet adaption projects are also finding it difficult to access funds for other reasons. Funding bodies tend to prefer investing green energy projects such as wind or solar, or even controversial mega hydro, which are more likely to offer a return of investment and can help reduce carbon emissions. Back in 2009, governments committed to provide 100 billion USD in climate change financing per year for developing countries by the year 2020. While money has begun flowing, a lot of it seems to end up in the same places, says Clare Shakya, Director of the Climate Change Group at the International Institute for Environment and Development (IIED). Big donors such as the World Bank are “all chasing after the same types of investments, … doing the same sorts of things, in the same geographies”, says Shakya. This means that “vast populations” are missing out on funds. The preference for reducing emissions is another reason why LDCs like Nepal are missing out. Nepal’s energy use is so low that its emissions are only around 0.0027 percent of global emissions, says Chhetri, which is why, he says, Nepal is more interested in accessing funds to help adapt to climate change impacts like increasingly unreliable rains. “Eighty percent of the people in the country rely on agriculture which means that we rely on rainwater,” says Chhetri. In fact, energy use in the world’s poorest communities is so low that increasing their access, whether through green or non-green energy, could also help them to adapt to climate change, says Shakya. “There’s all sorts of things that happen when you have access to energy that you don’t have without so it’s a vital part of resilience,” she said. Jessica Brown, Associate Director at the Climate Policy Initiative told IPS that there is “still a lot of momentum” from developed countries to “make good on the 2020 commitment” even with indications of a change in US policies towards climate change under the current administration. “On the renewable energy and energy efficiency side alone, there’s estimates that are in the trillions for what’s needed for the Nationally Determined Contributions and also the commitment to keep temperature increase below 2 degrees,” she said. Yet Brown also noted that “the overall economics on climate are moving in the right direction,” with technology costs falling and increasing private investment, making investments in green energy more popular. If the following sounds dramatic that is my intent. Today Trump’s climate misadvisers meet to hammer out a recommendation for the President which may have implications for the future of life on Earth. These misadvisers are expected to recommend president Trump with a policy on the Paris climate accords. Stay in or get out? The misadvisers include Rick Perry and Scott Pruitt. Neither accepts the warnings of the scientific community. Pruitt has strongly advocated that the US leave the agreement which can be done by presidential decree. Our country should not only stay in the agreements, it should become a major producer of technology for renewable energy. I fear that this will not happen because our butlers in the White House do not understand. Their policies may result in a repeat of what happened immediately after WW2 ended. At that time our automobile industry was the only one capable of mass producing cars for the rebuilding Western European population. The Europeans wanted small cars such as the Volkswagen. Detroit only offered the giant gas guzzlers of the time. A few years later Volkswagen, Fiat, Citroen, and Renault took over. The bug and the Renault Quatre became the most popular cars in Western Europe. The situation for renewable energy today is not completely the same as that of the cars in 1945. However, with encouragement, funding, and loans from Washington not only for the production of “green items” but for intensive research to come up with better ideas and products we may become one of the major leaders in renewable energy. And this is not a matter of “bringing old jobs back from China, etc.” but of stimulating the creation of new jobs right here. Why has that not yet happened and why will that not be at the top of the recommendations for Trump? Because God does not want us to monkey with his intents for mankind. Send in a planeload of condoms. That will help the climate more than money.